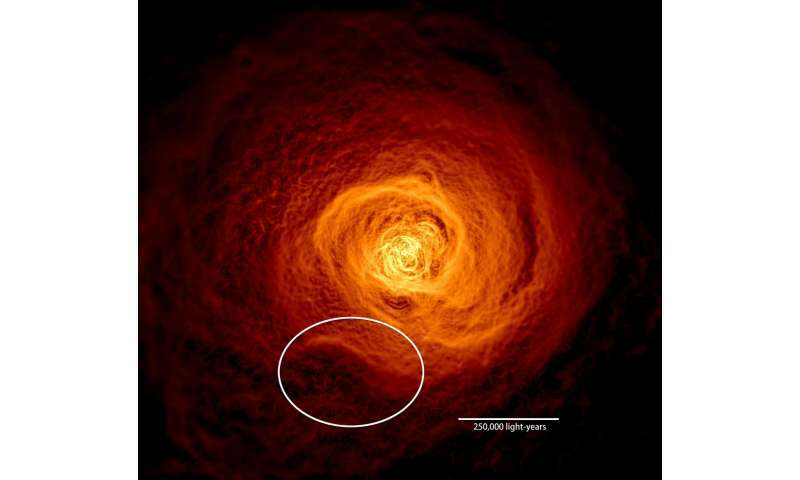 This X-ray image of the hot gas in the Perseus galaxy cluster was made from 16 days of Chandra observations. Researchers then filtered the data in a way that brightened the contrast of edges in order to make subtle details more obvious. An oval highlights the location of an enormous wave found to be rolling through the gas. Credit: NASA's Goddard Space Flight Center/Stephen Walker et al. This animation dissolves between two different views of hot gas in the Perseus galaxy cluster. The first is Chandra's best view of hot gas in the central region of the Perseus cluster, where red, green and blue indicate lower-energy to higher-energy X-rays, respectively. The larger image incorporates additional data over a wider field of view. It has been specially processed to enhance the contrast of edges, revealing subtle structures in the gas. The wave is marked by the upward-arcing curve near the bottom, centered at about 7 o'clock. Credit: NASA/CXC/SAO/E.Bulbul, et al. and NASA's Goddard Space Flight Center/Stephen Walker et al. There's a lot more than those. Edge detection is a big thing in medical image analysis. Each year new algorithms are published. ...and I rolled my own (as part of my PhD thesis), to detect edges within the bone (growth plates). i'm interested... can ya e-mail the paper ? The method and initial image is in our paper: arXiv:1605.02911 (Detecting edges in the X-ray surface brightness of galaxy clusters, Sanders et al 2016). It basically uses a Gaussian gradient magnitude filter to measure the gradient on various different scales. The image is convolved with the gradient of a Gaussian on some scale, both in x and y. The total gradient magnitude is calculated from these. Then we combine together the gradient on different scales. The image is convolved with the gradient of a Gaussian on some scale, both in x and y. Is there an adjustment for the angle of the major plane of the waves with respect to the projection plane? This may have some minor impact on the gradients in x and y. Thanks, @jeremy and @antialias. It's very interesting to see how these types of filters are used in practical applications. Adding some context: In my work I was dealing with medical CT images that had different resolutions in x/y and z direction. Which mean that any gradient approach would be skewed if it weren't adapted to deal with this. There's really a gazillion of these algorithms. Even though there are a few generic ones - which you will find implemented in photoshop, etc. - in science it's usually better to look at the specific problem and tailor the algorithm to take advantage of any additional information you have about the problem domain. Even though it upsets the 'artist' in me. I always yearn for this one 'best' algorithm. But I had to learn the hard way that problem specific solutions beat general solutions - always. The authors hope that by mathematically proving the futility of universal detection algorithms, they can, according to Larremore "free people up to work on specialist algorithms." antialias_physorg: We have the same spatial resolution in x and y. The technique here is being used to reveal structure - we're not using it very quantitatively. The main problem is the noise in the data, caused by the low number of photon counts. For a qualitative picture that's certainly not important. For quantitative results it might be. Noise is always a doozy. Simulating detector noise helps somewhat, but with a low S/N ratio there's often just not much you can do. Information that's not there is just...not there. I've seen algorithms that are geared to provide a better 'image impression'. But that always comes with a risk of increasing false positives.